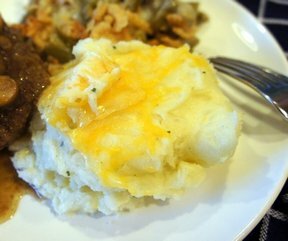 No ones wants to hurry up and mash potatoes minutes before a holiday dinner is served. These potatoes can be made up early and still be creamy when dinner is served. In a large pot of lightly salted boiling water, cook the potatoes, garlic, and bouillon until potatoes are tender but firm, about 15 minutes. Drain, reserving water. 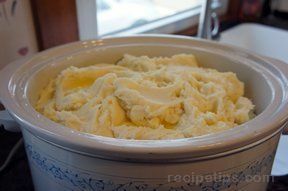 In a bowl, mash potatoes with sour cream and cream cheese, adding reserved water as needed to attain desired consistency. 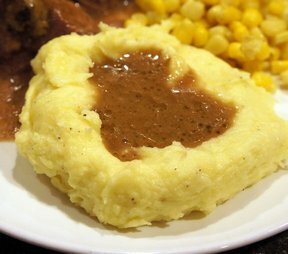 Transfer the potato mixture to a slow cooker, cover, and cook on Low for 2-3 hours. It can be helpful to spray slow cooker with cooking spray or use a liner. Just before serving, stir in butter and season with salt and pepper to taste. "Each year I make this for holidays. 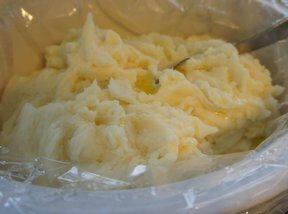 I'm up early to put the meat in anyway, so now the mashed potatoes are ready to go, too. The slow cooker liners are perfect. Any leftovers, I just let out the air and twist tie it before putting in the fridge. No dishes."